one step at a time... with Brain Gym®"
This is the statement of intention that my Brain Gym® colleague, Mary Ann Beebe, and I created for a very special project: We were hired by the Brain Injury Alliance here in Phoenix, Arizona, to offer two one-hour Brain Gym sessions per month for people who have experienced traumatic brain injury (TBI). It is incredibly rewarding to share Brain Gym with this special population. We never know who will arrive for these sessions, which are listed on the monthly schedule along with such classes as tai chi, karate, strength training, and aerobics, at the state-of-the-art Virginia G. Piper Sport and Fitness Center, part of the Disability Empowerment Center, where the Brain Injury Alliance has its offices. Not long ago, seven participants slowly arrived and found places for one of our Tuesday evening sessions – some walking, others in wheelchairs – and all had a family member or caregiver with them. Everyone that day was new. And there sat “Dan” in the front row, a young man in his 20’s, brought by his father for his first experience of Brain Gym. Dan was clearly doubtful, resistant, and distracted. We had no idea how Dan had ended up with a brain injury, which we could see had left him with some cognitive issues, and challenges using the left side of his body. Mary Ann and I introduced ourselves and the Brain Gym program, and led the group through a modified form of pace, the Brain Gym warm-up. Everyone but Dan seemed interested and ready to participate; Dan we ended up coaxing, humoring, and cajoling in a good-natured way, to complete these simple activities. Then we went on to the core activity of the day’s session, a group Brain Gym "balance." As licensed Brain Gym® Instructors, Mary Ann and I typically do balances with individual clients - children or adults - with special needs, or typically-abled - who want to make a change in some specific area of life. They may choose to address reading, focus, organization, coordination in physical skills, etc. In a one-on-one session, balances are focused on the specifics of that particular "learner" and his goal for change. A standard Brain Gym balance is a five-step process. The learner gets into his best pace for taking on new learning, sets an intention, or goal, for what kind of change he’d like to make, notices his current ability level at that target skill or ability, chooses Brain Gym movements that he’s drawn to in that moment, and notices changes in his ability or skill. We again simplified by choosing a single physical activity that we thought would work for everyone in the group to use for their initial “noticing.” Our intention is that any given physical activity will represent the kinds of coordination and cognitive challenges that people with TBI experience on a daily basis. On this day, we distributed balls and suggested that everyone see what they could do with them – bouncing, tossing – with or without a partner. Mary Ann and I modeled a few options. Some participants chose to partner with a caregiver or family member, and bounce the ball back and forth to each other. One man with limited movement chose to roll the ball from hand to hand. Another chose to bounce the ball on the floor next to his wheelchair, which he accomplished by simply letting go of it. His partner would catch it and return it to him, as it often bounced out of range of his reach. Dan chose to sit on his chair and bounce the ball on the floor, which he did with his right hand – the hand on the “unaffected” side of his body. After a few minutes of this activity, we asked everyone to notice what was working in how they were interacting with the ball, and what they wished was working better. Then we introduced the Learning Menu. 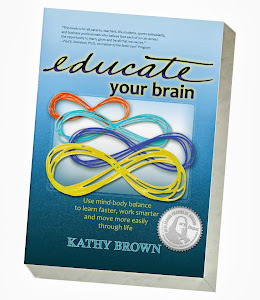 For each session, Mary Ann and I simplified by selecting a Learning Menu of just four Brain Gym movements (rather than offering all 26). That day we’d posted four photos on a large board, showing Brain Gym activities that we thought would be a good combination. We invited participants to call out which one they thought we should do first. Someone in the group suggested Arm Activation, so we demonstrated that, and supported everyone in experiencing it. That was followed by The Thinking Cap, Double Doodle, and Earth Buttons. Clearly doubtful, Dan made a running commentary throughout, asking questions about how each movement was supposed to help. When we had done all four Brain Gym activities, we invited everyone to return to their ball activity. Almost immediately, people began commenting on what they were noticing now: better aim, more energy behind their movements, improved coordination in catching. The man in the wheelchair was no longer just letting go of the ball - he was actually propelling it down with force, so that it bounced much higher, and sometimes he caught it himself. “Oh -- I am!” Dan said, with a really big smile. We joined the group in celebrating all the changes they’d noticed, and closed our session with a “cool down” consisting of Hook-ups and Positive Points. We wished everyone a great evening, and reminded them of when our next session would be. Everyone left with a copy of our modified pace process, and a page showing that day’s learning menu, so they could continue with these activities at home. Mary Ann and I love this rewarding work, which requires a whole new level of slowing down, being present and observant, and meeting individual needs. We love seeing the small changes that manifest in each and every session. And who knows how these small changes, one step at a time, will ripple out into the lives of each participant? Addendum: As Mary Ann and I were preparing for our most recent session, Dan walked past our training room accompanied by his mother, intent on using the weight machines. His mother paused just long enough to say, "Brain Gym is helping him so much!" Since our session was about to begin, and several people were just arriving, I didn't have time to ask for details. Dan had participated in only two of our group sessions, and had experienced a total of thirteen Brain Gym activities: the five movements from our modified PACE, and two different Learning Menus of four each. I can only assume that he is doing these Brain Gym movements regularly (perhaps with guidance from his parents). I look forward to learning more, when the timing is right! 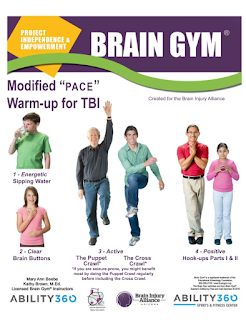 The standard pace warm-up consists of four Brain Gym activities: Sipping Water, rubbing Brain Buttons, doing the Cross Crawl, and doing Hook-ups. 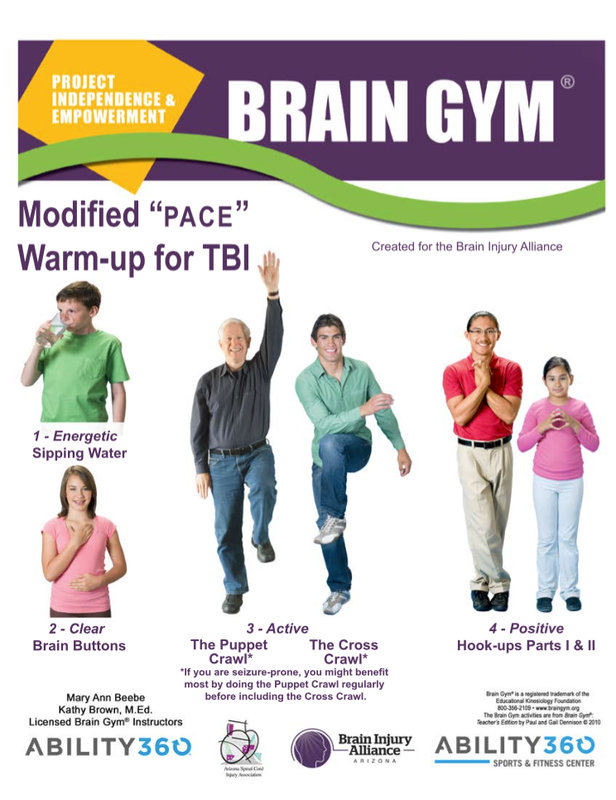 (For instructions on these activities, please see my book Educate Your Brain, or Brain Gym® Teacher’s Edition, by Paul and Gail Dennison.) Because some of these participants with TBI may also be prone to seizures, we use Cecilia Koester’s recommendation for modifying the pace process. For the third element, rather than starting with the cross-lateral Cross Crawl, we begin with “Puppet Crawl” which is a one-sided activity: raise and lower the right arm and leg, then raise and lower the left arm and leg, etc. We follow this with the Cross Crawl, telling everyone that if they’re prone to seizures, please omit the Cross Crawl, and do only the Puppet Crawl; once they've been doing the Puppet Crawl for some time, they may feel ready to include the Cross Crawl. We all then finish with Hook-ups. My clever photographer husband created large cards for us in the same format as the wonderful cards produced by Edu-Kinesthetics. He began with the 12 photo images he’d taken for my book, Educate Your Brain, then added others we’d taken, to give us a set of all 26. Copyright© 2014 by Kathy Brown. All rights reserved. "Modified PACE" page Copyright© by Kathy Brown, 2015. All rights reserved. Photographs copyright© Laird Brown Photography. All rights reserved. So often, I'm learning new things from your writings....thanks for sharing. Hi Ruth, Thanks for your comments. I'm glad you find my Blog postings valuable! We've used both balls and beanbags so far, with people either sitting or standing. Once we get more people repeating, Mary Ann and I will be able to divide the group so we can use more diverse activities. Some folks are able-bodied, and would benefit from a more physical assortment of activities. Thanks so much for sharing. I am feeling very inspired. You offer so many practical & creative tips to use, I definitely will be borrowing many of them in my work. Thank you for detailing your adaptations for group work! They are highly valuable, and, since the people who need Brain Gym will always exceed the people who can facilitate it, I really appreciate you being so generous by sharing. Thank you for detailing your adaptations for group work! Since the number of people needing Brain Gym will always outnumber those who can facilitate it, I appreciate your generous sharing. Dear Radiance Mind-Body Wellness -- Thanks for your comments! I love coming up with creative ways to work with groups. This project is particularly challenging because of all the things that are impossible to know ahead of time about each individual participant and how he/she may have been affected by traumatic brain injury. The results have been quite rewarding!